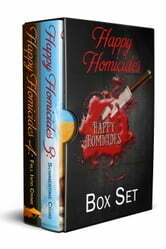 Get both Happy Homicides 3: Summertime Crime and Happy Homicides 4: Fall Into Crime. 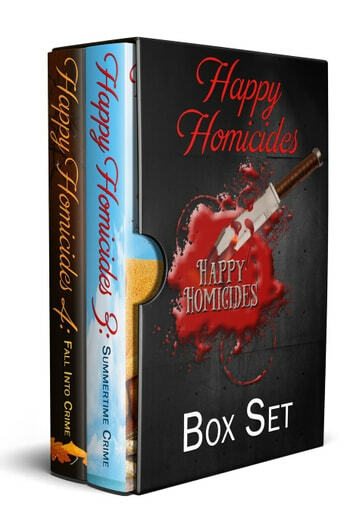 A fun, fabulous box set that will treat you to hours of delightful, mystery-loving, reading pleasure. Two books, 21 stories, and 746 printed pages for less than the price of one book! You’ll enjoy these clean mysteries by bestselling and award-winning authors. Plus, you can email us (using the super-secret email address) us and receive two free, bonus gift files filled with recipes and craft ideas. Authors and their stories include Joanna Campbell Slan’s Cara Mia and the Empty Nest; Linda Gordon Hengerer’s Dying for Graduation Tea: A Beach Tea Novella; Margaret Lucke’s A Fair Day for Murder; Nancy Jill Thames’ A Birthday Bash; Teresa Trent’s The Dog Days of Murder; C.A. Verstrate’s Surf’s Up; Randy Rawls’ A Simple Case of Stalking; Terry Ambrose’s Murder on Front Street; Jeffrey Marks’ Short Order Dead; Deborah Sharp’s Bubba Trouble: A Mace and Mama Short Mystery; Joanna Campbell Slan’s Kiki Lowenstein and the Shark Bait; Joanna Campbell Slan’s Vendetta: A Cara Mia Delgatto Mystery; Linda Gordon Hengerer’s Dying for School Tea: A Beach Tea Shop Novella; Carole W. Price’s The Glass Birdhouse; Lesley A. Diehl’s Bobbing for Murder; Nancy Jill Thames’ Raven House; Teresa Trent’s Falling for Murder; Randy Rawls’ Accident, Suicide, or Murder; Terry Ambrose’s Spirit in the Rock; Deborah Sharp’s Haunting in Himmarshee; and Joanna Campbell Slan’s Kiki Lowenstein and the Doodoo. Scroll up and grab a copy today! Why not "gift" one to a friend? Wouldn’t that make a nice surprise?